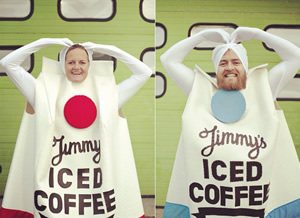 Jimmy’s Iced Coffee is one of our favourite new brands. Available in a range of tasty flavours it’s a very cool and refreshing way to get your coffee hit. We caught up with founder, Jim Cregan, to get the story behind the coffee. Where did you get the inspiration to start an iced coffee company? In Tasmania, my favourite place in the world. I was travelling there with my girlfriend, we’re now happily married, and iced coffee was a huge craze. I couldn’t get enough of it. So that was enough for you to start your own business? Oddly, yes. I just thought it was such a great, and popular, product that there had to be a market for it in the UK. I was sure my friends would love it and that’s always a good place to start. How did you come up with all your iced coffee brews? It was a long and painstaking process but heaps of fun too. We used my sister Suzie’s café as a kind of late night lab and tested and tasted through the night. We came up with some great ideas and Suzie is now my business partner! Your brand doesn’t feel like other brands. How is your approach different do you think? We certainly try not to sound like other brands! Our approach starts with our strap line ‘Keep your chin up’. We try to make everything we do positive and fun. A coffee is an everyday pleasure; it should be fun. We’re optimism in a carton! You mentioned social media. How important is it to smaller brands like you? Very. We love social media. Facebook, Instagram, Twitter all of them. We try to have some fun with our fans – we’re currently playing a fake moustache game on Facebook for example! Can people contact you if they want to know more about the brand? 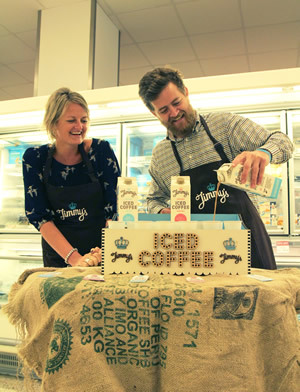 This entry was posted in Talking Ocado and tagged Iced Coffee, Jimmy's by Ocado. Bookmark the permalink.